SEATTLE, WA / ACCESSWIRE / March 1, 2016 / Nevada's provisional licenses are set to expire in May of this year, which means that companies that haven't made "significant progress" towards opening risk losing their license. These licenses are valuable, despite the state's small population, since the state permits out-of-state visitors with medical marijuana cards to buy from local dispensaries. If recreational legalization passes in 2016, the license could become a whole lot more valuable, especially in Las Vegas. DigiPath Inc.'s (DIGP) CEO Todd Denkin, which operates a testing laboratory in Nevada, figures that there are 20 fully licensed cultivators, nine open dispensaries, seven testing labs, five licensed production labs, and three licensed edible makers in the state. Growblox Sciences Inc. (GBLX) is another publicly traded company, which has secured licenses for four cultivation labs, the first of which they are opening in Las Vegas. With a staggering 42.3 million visitors in 2015, tourism in Las Vegas amounted to more than 15 times the entire population of the State of Nevada. These tourists are driven to world-class hotels and casinos, including Caesars Entertainment Corp. (NASDAQ:CZR), Wynn Resorts, Limited (NASDAQ:WYNN), Tropicana Entertainment Inc. (TPCA), Las Vegas Sands Corp. (NYSE:LVS), and MGM Resorts International (NYSE:MGM). DigiPath Labs' Las Vegas testing facility opened in May of last year, and has completed more than 500 samples to date according to Mr. Denkin, which makes it a leader among its peers. With four new customers signing exclusive laboratory agreements last quarter, and more cultivators coming online, the company appears to be well positioned in the booming Las Vegas marketplace. DigiPath Labs Office & Employees - Source: DigiPath Inc.
By signing long-term contracts with product producers and dispensaries, the company should generate predictable revenue growth as its clients scale their businesses. Management indicated in its fourth quarter 10-Q filing that it anticipates steadily increasing lab testing revenue during the remainder of the fiscal year ended September 30, 2016 as it continues to sign new clients and expand this revenue base across Nevada. "Our analysis not only helps product producers and dispensaries screen out products with dangerous levels of contaminants, we also quantify the medicinal compounds present in samples, so patients and caregivers can choose products that have been shown to relieve their specific symptoms," said Mr. Denkin in a May 2015 press release announcing the lab's opening. The upcoming influx of production facilities and dispensaries coming online to beat the state's May deadline for provisional licenses means that these financials could significantly improve during the second quarter of 2016. During this key period, testing labs that secure contracts early on will be in a good position to keep those clients as they scale up production over the coming year – and especially if recreational legalization passes in November. Over the long-term, GreenWave Advisors predicts that the cannabis testing market will reach $850 million by 2020, processing a little more than five million pounds of marijuana. 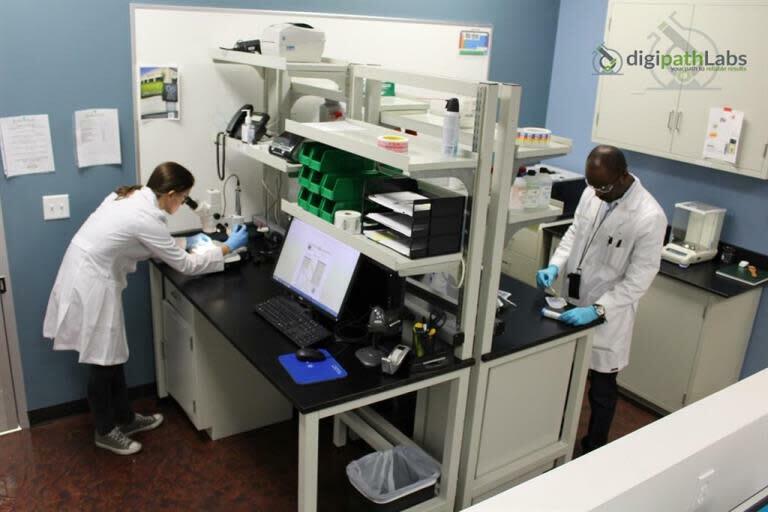 With the recent industry shakeout, the company's robust laboratory testing procedures, 48-hour turnaround time, close relationships with clients and extra services like chemo profiling for specific strains, DigiPath sets itself apart from the rest of the market. DigiPath's business plan includes expansion by replicating its success in Nevada across other states where the drug has been legalized. By leveraging best practices and a track record in a relatively strict state, the company should have a much smoother time opening up new labs in other states. Dr. Cindy Orser, PhD, Digipath Labs' Chief Science Officer, has been awarded a conditional state license in Colorado and has also been very active on the Colorado pesticide committee and other National Lab Organizations that help shape legislation. Investors looking to take advantage of a growing niche within the multi-billion dollar cannabis industry may want to take a closer look at DigiPath. For more information, checkout their website at www.digipath.com. Except for the historical information presented herein, matters discussed in this article contain forward-looking statements that are subject to certain risks and uncertainties that could cause actual results to differ materially from any future results, performance or achievements expressed or implied by such statements. Important factors that could cause these differences include, but are not limited to, the Company's need for additional funding, the demand for the company's services, governmental regulation of the cannabis industry, and the company's ability to execute its business plan. Emerging Growth LLC dba TDM Financial, which owns CFN Media, is not registered with any financial or securities regulatory authority, and does not provide nor claim to provide investment advice or recommendations to readers of this release. Emerging Growth LLC dba TDM Financial, which owns CFN Media, may from time to time have a position in the securities mentioned herein and may increase or decrease such positions without notice. For making specific investment decisions, readers should seek their own advice. For full disclosure please visit: http://www.cannabisfn.com/legal-disclaimer/.